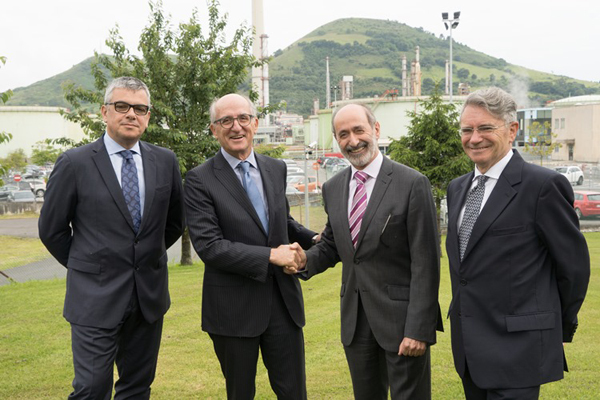 Eduardo Junkera and Javier Rodríguez, president and director of CIDETECrespectively, met on 14 June with the president of Repsol, Antonio Brufau, and the president of Petronor, Emiliano López Atxurra, to follow up on the collaboration agreement between these entities to develop technologies to minimise or remove the current limitations of electric mobility. The work is focused on achieving a specific energy with the appropriate density so that, using a battery of a similar weight and size, autonomy can be increased. The main objective of this collaboration is to promote and develop technologies that can help electric mobility and its expansion in a more complete way. The aim is to substantially improve existing batteries, oreven to go further, by developing disruptive storage technologies. The meeting took place in Petronor's facilities, an entity that joined the CIDETEC board of trusteeson 1 June.